Each edition of PMSA Notes will include a spotlight on a noteworthy PMSA member. 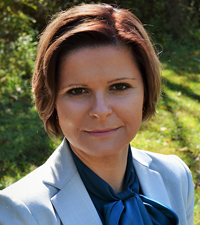 This month's spotlight focuses on PMSA Journal contributor and 2017 conference presenter Ewa J. Kleczyk, Symphony. PMSA: How many years have you been in the industry? Ewa J. Kleczyk: I have been in the industry for over 12 years. PMSA: What attracted you to the field? EJK: Having my doctorate degree in Economics allowed me to look for careers in many industries, as the skill set can be applied to vast areas, such as government work, health economics, finance & banking, and market research. Due to my deep belief in the importance of healthcare to the sustainability, prosperity, and economic growth of a country, I looked for opportunities that would allow me to get involved in industries related to this area. PMSA: How did you first hear about PMSA? EJK: I learned about PMSA from a former colleague of mine, who recommended that I attend the conference, as it would be beneficial to my professional development, networking, and career progression. PMSA: How many years have you attended the PMSA conference? EJK: I have been to the conference three times over the years. The 2017 PMSA Conference will be my fourth, and a second time presenting at the event. PMSA: Please describe any current projects you are excited about. EJK: Insights from healthcare claims data have been leveraged for many years in aiding the decision making process for optimizing marketing and sales resources. However, to fully utilize the breadth and depth of the data, we have started applying machine learning techniques to provide an effective and precise way of exploring the high dimensional patient level claims datasets to help identify therapy starts and changes. Leveraging expanded machine learning insights and findings can aid brand managers by providing more exact and refined optimization of sales and targeting strategies and resources, as well as their deployment timing. PMSA: Do you have any predictions for the future? EJK: This is an interesting question. With the Affordable Care Act and most likely with the newly proposed American Health Care Act, the trends are moving towards patients having a greater involvement in their healthcare decisions. This is not only due to existing or upcoming policies shifting the decision-making process, but also due to the vast amount of information that is easily available for patients to access at any point in time. Physicians are no longer the only decision makers in patients’ care. Rather, they should work along with their patients and insurance providers to optimize the treatment algorithm. With these changes, marketers are also altering how they approach patients, what information is available for decision making, as well as the optimal timing and resources available for reaching patients to inform their decision-making process. PMSA: Do you have any professional advice you would like to share? EJK: Often when mentoring young professionals, my most valuable advice to those starting their careers is to be passionate and patient, to take initiative, to network, and to prioritize their professional and personal goals. Passion for the performed work drives motivation and patience. Prioritization allows for setting realistic and attainable goals. Taking initiatives aids stepping out of one’s comfort zone, and lastly, networking allows for developing professional relationships outside of the place of work. PMSA: What do you like to do during your free time? EJK: My husband and I love going for long weekends to Maine. My husband grew up there, so the state has a special place in our hearts. His family owns a lake estate where the entire family gathers and celebrates holidays, as well as spends summer weekends at. I love to sit by the lake, watch the water and trees, and just relax by a bonfire.